In the 1700’s Brookfield was an area of rich farm lands, forests filled with game and streams abundant with fish. It was called Newbury, a name derived from the three towns from which its land was taken (New Milford, Newtown, and Danbury). Here lived a hardy breed of people. They believed in hard work six days a week, and on the Sabbath they rested and attended worship, even though it meant a ten mile trip to New Milford, Danbury, or Newtown. Because of the hardship of winter travel, 1752 saw the introduction of winter church privileges. Worship was allowed to be conducted in the homes from September to March. In 1754, the General Assembly finally granted the petition for the Parish of Newbury to build their own meeting house and call their own minister. On September 28, 1757, the first Congregational Church building was dedicated, and the Reverend Thomas Brooks was ordained as the first settled minister. In 1778 the Town was incorporated. The name Newbury was changed to Brookfield in honor of the Reverend Thomas Brooks, who was still the minister. The first Town Meeting was held on June 9, 1788. As early as 1732, there was industry along the Still River, and the area became known as the Iron Works District. Found here were the furnaces for making iron, the ever important grist mills, sawmills, comb shops, carding and cotton mills, a paper mill, knife factory, hat factories, and others. Still standing today is the grist mill (now the Brookfield Craft Center) and the Iron Works Aqueduct Company. This company was formed in 1837 to supply water from the mountain springs to the Iron Works District an d today it still supplies water to the area. Indian trails were the first roads for travel. As the area became more populated, roads were laid out. Wagons and stagecoaches became the main means of transportation. Toll gates were used on the main roads to pay for the upkeep of the roads and salaries of the gatekeepers, and the dividends went to the owners and stockholders of the roads. Travel was slow and it took three days to travel to Bridgeport, conduct business, and travel home. At one time there were two train stations: one in the Iron Works District and the Junction Station located near the corner of Junction Road and Stony Hill Road. The trains carried freight and visitors into and out of Brookfield, and young people from Brookfield traveled from the Junction Station to Danbury to attend high school. During early Colonial days it was required by law to establish a school if a town had at least fifty families. In January, 1756, it was voted to maintain a school for six months each year, two months in the New Milford District, two months in the Danbury District, and two months in the Newtown District. By 1808, there were eight school districts within Brookfield. After many heated debates about taxes, the Brookfield Consolidated School was built to replace the one room school houses in Town. This school was built in 1938 and is now called Center School. Besides the public schools, many private schools were located here: The Saint Paulís School for Boys, the Curtis School for Boys, a Town Singing School, and the Greene School of Music. Electricity was first brought to Brookfield in 1915, when the Danbury and Bethel Gas and Electric Company hooked up the homes in Brookfield Center to their electric lines. By the late 1920’s electricity was in more demand. The Connecticut Light and Power Company built the first hydroelectric plant in America at Rocky River, just north of New Milford. A reservoir for the water was needed, so land from Danbury, New Fairfield, Brookfield, and Sherman was taken. This land also included ponds named Neversink, Barses, and Squantz. By 1928, the plant was finished and Candlewood Lake was formed. It is the largest man-made lake in Connecticut. Brookfield Town Park is located on the Candlewood Lake Beachfront. For many years a small parcel of land that was part of New Fairfield was separated from the rest of New Fairfield by Candlewood Lake. In 1961, this land was annexed from New Fairfield to Brookfield and it is now called Candlewood Shores and Arrowhead Point. 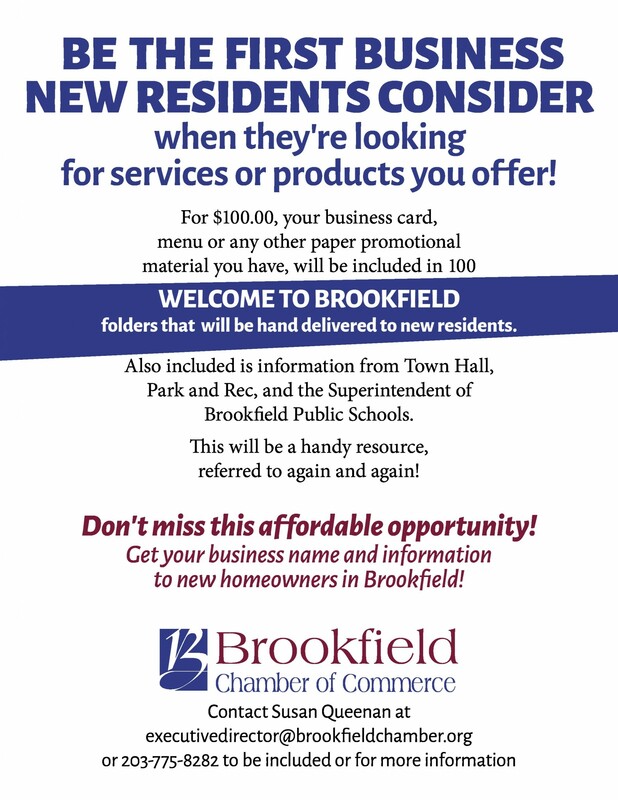 Brookfield is a growing community with a population of approximately 16,000. Instead of one church, there are now churches of many denominations. There are four schools in the public school system, one private school, and several nursery schools. Many of the historic structures have been preserved and in 1991 Brookfield Center was named to the National Register of Historic Places. *Information in this briefing was provided by Marilyn Whittlesey.